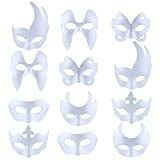 White Masquerade Masks On Sale! 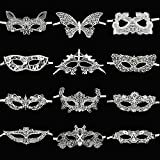 DIY unpainted while mask, you can use your imagination to DIY the mask you like.Perfect for doing arts and craft and making mask.It's the best product for your for Halloween. Primed & Ready to Paint. 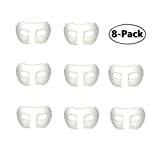 paper plup material can easy to paint on this white party masks. Pls note this before you purchased it. Flexible strap is easy to wear, the DIY white mask greated with very light-weight quality materials for long hours of comfortable wear. One size fits most. Interesting work, having fun together. Material:Plain Mask is made of high quality paper pulp material, comfortable to wear and no smell. Specification:12Pcs Same paragraph white mask size are 19*10cm and weight are 16g.Can suit for long hours of comfortable wear and comes with an elastic strap for easy wear. Prefect design:Blank white mask is great for DIY painting on it and use your imagination to DIY what patterns and colors you like,and porous design makes you breathe fluently and see more clear. 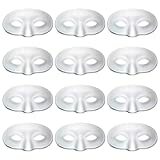 Occassions:White mask is the ideal product for Halloween, Masquerade, Mardi Gras, Wedding, Prom, Fashion Shows, Costume Party and other special events to create special and memorable moments for you and your friends. 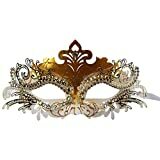 Package include:12Pcs Same paragraph white mask,Enough you and your friends use and very popular among the young.